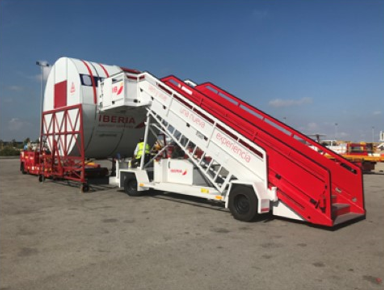 With the main goal to be able to complete the practical training of our ramp agents training plan, in an entertaining environment before starting over the “real working” world, Iberia Airport Services starts in Madrid and Barcelona its new dummy models . Thanks to this platform our employees train all over again, until they become confident with the equipment aircraft positioning. In addition, we do stress in the best safety working practices and we explain procedures that we do have established as for example the brake safety rules and equipment marshaling. At the Madrid-Barajas training centre, a section of an A320 (registered as EC-FDB) is used, and in Barcelona custom-designed model built by the Comanche company does the job. Both stand at the actual height of a real aircraft, and allow trainees to practise loading in number 5 and aft cargo holds.